These Wooden A-Boards Fit into Vehicles. The Sidewalk Frame is not Meant to be Used in Poor Weather. 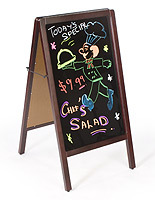 These Wooden A-Boards that are for Indoor Use can be Used Outside Under Fair Weather Conditions Only. 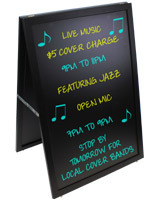 Common Size: 18" x 28"
20" x 42" 24" x 36"
Double-sided blackboard for potentially attracting twice the number of customers. 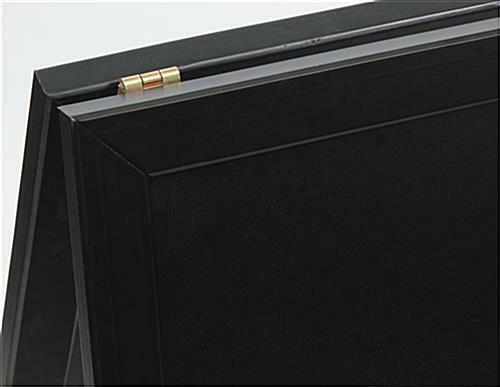 Hinged black wood frame closes to easily transport. 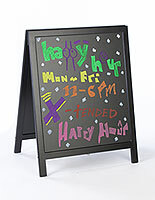 Matted textured blackboard for use with stick chalk, liquid chalk, or wet-erase pens. (2) 18"w x 28"h Writing surface for large easy to read advertisments. 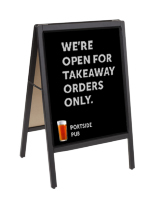 These wooden a-boards have a middle hinge to prevent over extending. 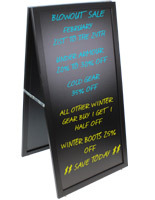 The sidewalk frame has a matted textured blackboard on both sides of the display! 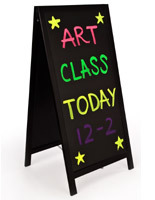 These wooden a-boards that have (2) 18"w x 28"h writing areas can be written on with either wet erase pens, liquid chalk, or stick chalk. This sandwich frame can quickly be cleaned off with a damp cloth. These retail signs, wooden a-boards have a magic eraser. The magic eraser makes it easy to remove even the toughest markings. These wooden a-boards have a pine frame. The display comes in a black finish to fit any restaurant, bar or retail store's decor. These wooden a-boards are great for front vestibules. Each sidewalk sign has hinges that allow the sandwich frame to quickly close or open. 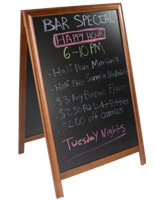 These wooden a-boards that are for indoor use can be used outside under fair weather conditions only. The sidewalk frame is not meant to be used in poor weather. These wooden a-boards fit into most vehicles for easy transportation to different events. This sidewalk sign can display different advertisements every day. 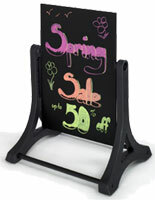 These wooden a-boards can be seen from either direction in an aisle or on a sidewalk. The sandwich frame is perfect for stores that have constantly changing deals or nightly entertainment. 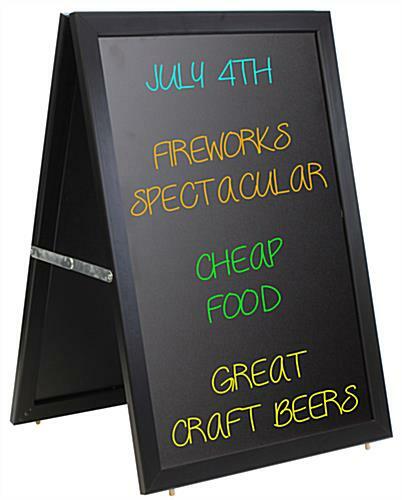 Please Note: These menu chalk boards are designed for indoor use only. However, they can be used outdoors under ideal weather conditions. 21.3" x 31.3" x 18.5"